When someone with social phobia is in a social situation, it can be a stressful experience for them. If you are giving a public performance, you may experience constant concern about the possibility of embarrassment and fear that may even lead others to see you as an anxious and weak individual. You may experience a broad range of social phobia symptoms as detailed below. These individuals may fear public speaking because they believe that others will not like their voice, and their hands are always shaking, or because they think that at any moment they will be invaded by extreme anxiety. These people have a constant fear of conversation and think that they won’t be able to articulate words correctly. They may avoid eating, drinking, or writing in public for fear of encountering difficulty. 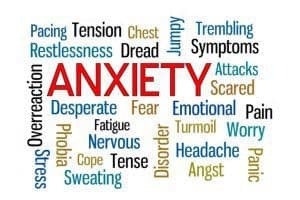 Individuals with social phobia experience anxiety symptoms almost always and in the feared social situations, the redness, is very typical of social phobia. Some of the most common physical symptoms are tachycardia, [easyazon_link identifier=”B013VRX2M6″ locale=”US” tag=”cheesecakerec-20″]tremor of hands[/easyazon_link] or body, abdominal discomfort, redness, muscle tension, dry mouth and sweating. These symptoms are often accompanied by great emotional distress, where low self-esteem and feelings of discouragement are usually permanent. 1. High levels of anxiety and stress, which can manifest as excessive sweating, roaming/pacing and the person suffering will move their legs continuously while sitting. 2. The person suffering from a social phobia will have impairments in communication, both verbal and nonverbal due to anxiety, may run out of words, or express disjointed and nonsensical phrases. 3. The person will have continuous invasive and uncontrollable thoughts of failure in life and believes that he will be judged. These will start even days and weeks before having to attend a public event such as a meeting or a company dinner. 4. Feelings of shame, fear, and insecurity about the possibility of being evaluated by others, showing timidness to others, blushing when he is in the presence of others, and even to feel physical discomfort, such as stomach pain or shaking hands, if the situation continues. 5. Awareness of irrationality, for which the person realizes that what he thinks and feels is excessive and exaggerated and unrealistic, and yet cannot help it. 6. The person will have a tendency to avoid places or events where he will provide exposure socially and will make excuses to avoid having to deal with a situation that is convinced by himself will be disastrous. 7. The person will have problems maintaining friendships, which can also potentially affect intimate relationships because both cases require a certain level of social activities, whether recreational or cultural and the person suffering from social phobia is not willing to accept. These symptoms are expressed to a greater extent when the people affected by social phobia have to maintain contact with people that are unknown to them or have a significant social or occupational importance to them. Also, when they meet someone they like, the symptoms described increase to a greater extent. – Fear of meeting new people or having [easyazon_link identifier=”B00WEFZQGM” locale=”US” tag=”cheesecakerec-20″]constant anxiety[/easyazon_link] when introduced to new people for the first time. – Excessive anxiety in everyday social situations (with familiar people). – Fear of eating, drinking or writing in public. – Fear of using and sharing public places: toilets, canteens, study rooms, etc. Do you experience any of these symptoms and how did you cope? Please comment below and share your thoughts.